I first was exposed to Tai Chi Chuan when I was living in Manhattan in the early 1980s. I studied with Sifu BP Chan at the William Chan club at 23rd and 7th Ave. He was all about getting his students healthy first by utilizing breathing, visualization, and meditation. His teachings were deep and knowledgeable. I was with him for about a year before I had to move back to Toronto. My journey with the Wu family started in 1983. After spending about one-year researching I went to the Wu`s club on Parliament Street. Sifu Eddie Wu (Wu Kwong Yu) taught me the 108 movements of the form. I accepted Sifu Wu’s invitation to become his disciple in 1989. I have studied the double edge sword (Gim), Sabre Form and many types of push hands as well as Qigong (Chi Kung) and meditation techniques. One of the important aspects of the Wu style is the quality of the teaching. It takes many years of study and practice to become an instructor and it is a privilege to do so. It has been an honor and a privilege to have studied with the 5th generation and gatekeeper of the Wu family, Sifu Eddie Wu (Wu Kwong Yu). His teaching brought me to where I am today…studying with fourth generation Gong Yi disciple Sifu Rock Kwok Tai Ng. Sifu Rock Kwok Tai Ng is a fourth generation disciple of the third generation Wu Gong Yi Taijiquan (tai chi chuan) from the Wu lineage. I am now 5th generation disciple of Sifu Rock Kwok Tai Ng. I am learning the 13 disciplines using the tendon system which is very internal. I am honored to study with Sifu Rock. On May 31, 2006, I was involved in a very bad car accident. I was not expected to make a recovery back to a normal lifestyle. I had a severe concussion, a collapsed lung, damaged liver and spleen, a fractured tailbone, paralyzed left vocal cord, several missing teeth, and my right ear was torn off. Two months after the accident I blacked out while visiting my daughter due to bleeding on the brain and had to undergo an operation to drain the blood. Three months later I underwent a triple bypass heart operation. Within six months I was jogging for 3.5 kilometers and training 5 times a week. The doctors all said it was because I had been doing Tai Chi Chuan for so many years that my recovery was much faster and more complete then they had expected. I have been studying & teaching Tai Chi Chuan for 35 years. 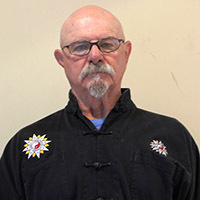 I am certified to teach all levels of Tai Chi Chuan, several different hand forms, Qigong (breathing), meditation as well as self-defense and weapons. I continue to research, train and study daily. 2) Improvement in general health. Helps cure or prevent long or short-term illness. 3) Self-improvement and control through meditation in movement. 5) Enjoyment derived from the 108 form. 6) Exposure to an art and philosophy that is interesting and energetic. I have been studying & teaching Tai Chi Chuan for 35 years.